Shoprite is lending a helping hand to students across South Africa to ensure that their money goes a little further by introducing National Student Day on 27 September. National Student Day will enable students between the ages of 18 and 30 to get 10% discount on their shopping (up to a maximum spend of R 1 500). Students are required to register by dialing *120*569* followed by their ID number and the hash key (*120*569*ID NUMBER#). After registering, they will receive a SMS or e-mail with a unique coupon which needs to be shown to the cashier, along with their student card, at the till before they pay on the day. The coupon is only valid on Wednesday, 27 September 2017 and is not redeemable at LiquorShop, Money Market or MediRite. 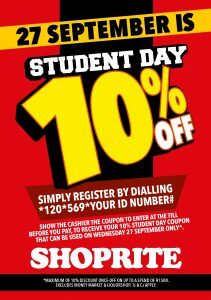 The Student Day promotion is valid at all Shoprite stores across South Africa.